North Korea Launches Long-Range Rocket : The Two-Way Pyongyang says its launch is for an "observation satellite," but many nations view the launch as a concealed long-range missile test. So far, there has been no damage to boats or planes in the area. 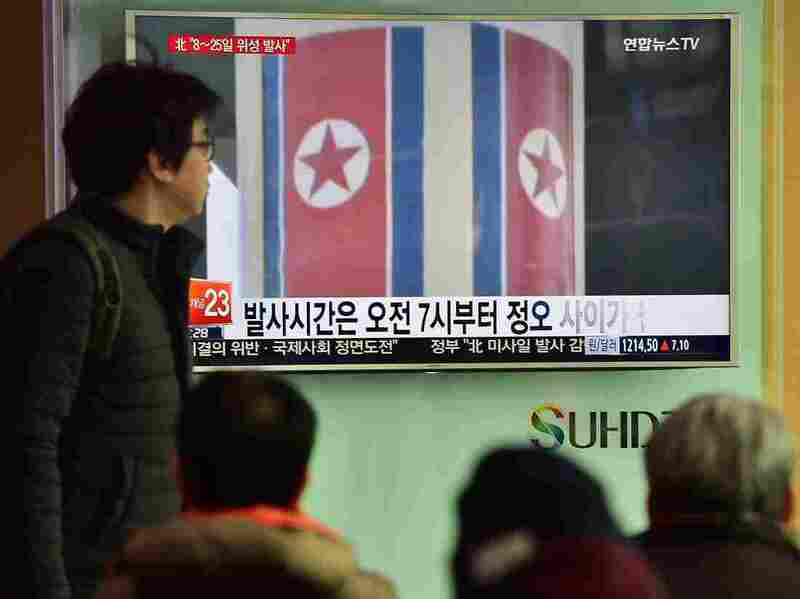 State TV announced North Korea successfully launched a long-range rocket Sunday morning local time, and says the North plans to launch more satellites in the future. Pyongyang had informed the United Nations International Maritime Organization that it planned to fire a rocket into orbit sometime between February 7 and 14. The South Korean defense ministry says the rocket was fired from North Korea's Sohae launch site. So far, there has been no damage to boats or planes, according to South Korea's Oceans and Fisheries and Land and Transport ministries. "We condemn today's launch and North Korea's determination to prioritize its missile and nuclear weapons programs over the well-being of its people, whose struggles only intensify with North Korea's diversion of scarce resources to such destabilizing activities," U.S. National Security Adviser Susan Rice said in a statement. She called the launch a "flagrant violation of multiple United Nations Security Council resolutions." North Korea describes the launch as part of its space program: a rocket carrying an earth observation satellite into orbit. But many governments regard the launch as a concealed long-range ballistic missile test. The U.S., Japan and South Korea have requested an emergency meeting of the U.N. Security Council on Sunday. In addition, the South Korean defense ministry said on Sunday they will begin talks with the U.S. about possibly deploying a missile defense system in North Korea in response to what many nations see as a rising threat of North Korea's weapon technologies. "If THAAD is deployed to the Korean peninsula, it will be only operated against North Korea," Yoo Jeh-seung, a senior official at the South Korean defence ministry said in a joint news conference with Thomas S. Vandal, commander of the Eighth U.S. Army based in South Korea. The launch follows a Jan. 6 nuclear test that violated U.N. Security Council resolutions. That test — which North Korea called a "hydrogen bomb" test, a claim experts are skeptical of — raised tensions in the region and prompted widespread criticism from the international community.